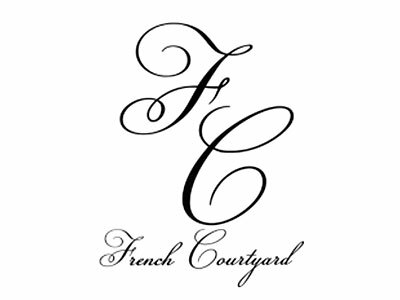 At French Courtyard all things delightful come together to create a rewarding and delightful shopping experience. Our shop is filled with nationally recognized manufacturers of new home furnishings and accessories including furniture, lamps, mirrors, wall décor, candles, candle holders and seasonal items to adorn your home. The new offerings accentuate the smattering of beautiful antiques and high-quality, consignment pieces throughout the shop. The front doors of French Courtyard always showcase the work of our in-house floral designer. She can create a custom floral piece or you can choose from one of several arrangements throughout the store that she has created. You choose your florals, choose from one of our containers or bring your own. When you purchase our florals there is never a design charge. Our continuous introduction of new pieces inspires our clients' decorating senses and heightens the desire to return to see what is new in the shop. We love to show our appreciation to our customers; Ladies’ Luncheon, Customer Appreciation Soiree, and Wine & Cheese Party. Homemade cookies and fruit infused water are often found in the store on Saturday afternoons. Come join us, sign up on our website for our Preferred Customer Email list to find out about our in-store specials and to find your own treasures in our store. The French Courtyard is a unique and eclectic home décor “gem” tucked away in Oak Ridge North, just a mile and half from the maddening crowds of Market Street, The Waterway and The Woodlands Mall. You will find ample parking within a few steps of our front door to make your shopping experience even more pleasurable. Please Like & follow us on Facebook.